I continue my preoccupation with the long term trend, especially since Nifty has moved into uncharted territory.Looking at the bullish alternative scenario, on a monthly scale,from January 2008, Nifty had been forming an ascending triangle with a horizontal bias.Interestingly b leg is less than a leg. In fact e<d<c<b<a. So it is a regular limiting triangle. As per pattern implication, the thrust out of the triangle has to be 100% of the largest leg + or - 25%.Largest leg is of a ( 6357-2253 = 4104).Range of the thrust then is between 4104x0.75+5119 and 4104x1.25+5119, which is between 8197 and 10249. 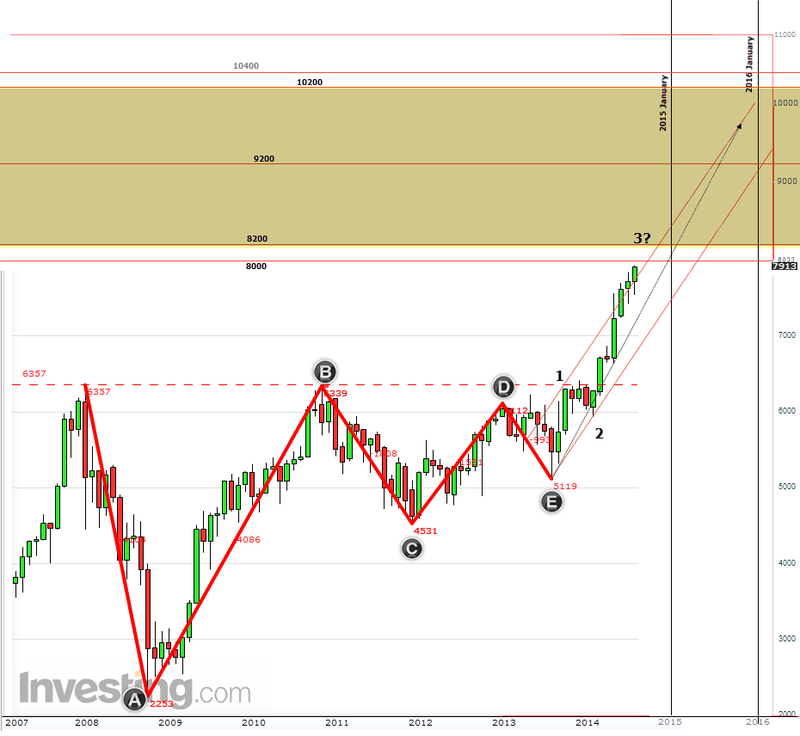 With the long term correction ending at 5119, then we are in an impulsive atmosphere, with the wave 3 currently in progress. 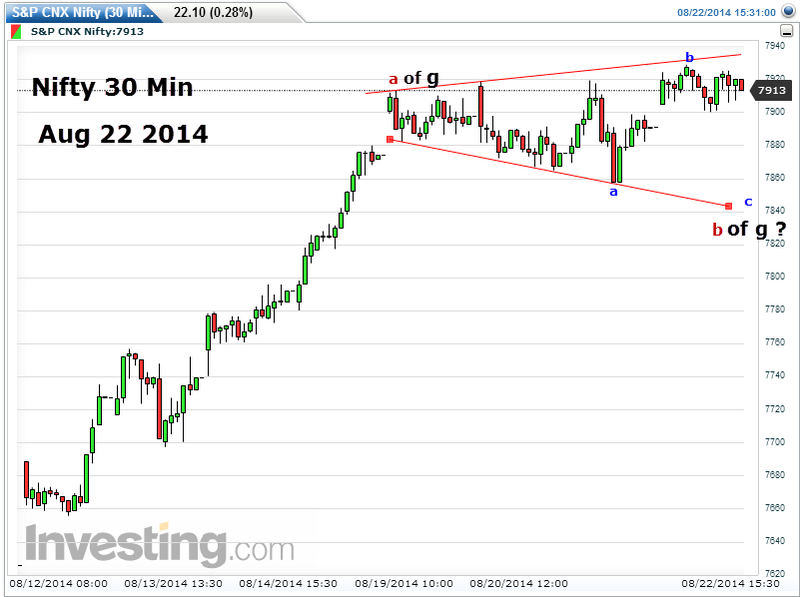 Looking at the 30 min chart, we are looking at a different triangle altogether.. 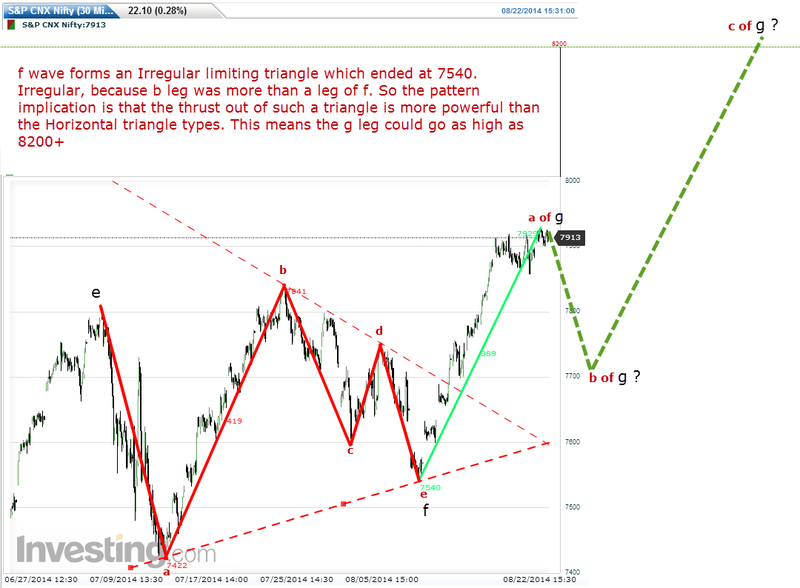 Here the triangle is irregular, because wave b was larger than wave a.So the thrust could be 1.618 times the length of the largest leg of the triangle.This puts the tentative target for wave g ( Iam maintaining the diametric counts for the time being ) around 8200. 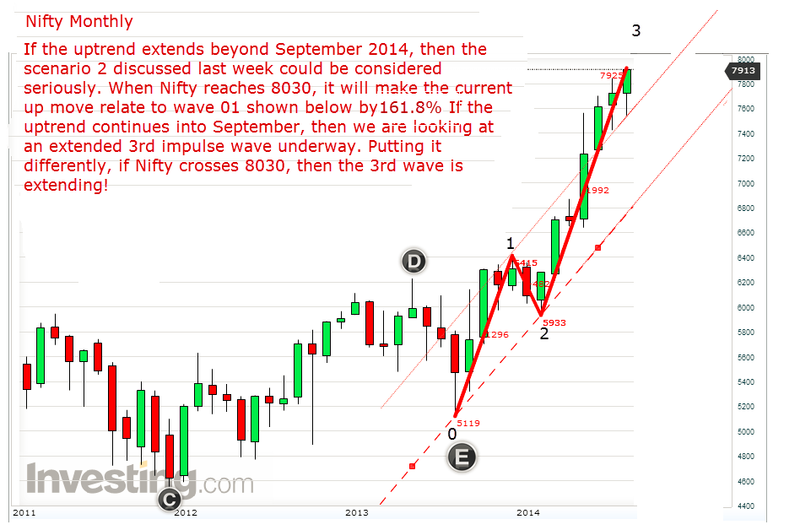 Now, last week it was observed that Nifty is operating through uptrend fractals-that is of late, the uptrends seem to be lasting for 8 to 10 days.Friday, August 22, marks the end of a 10 day period.So we may technically expect a correction ( b of g) this coming week, before Nifty turns up once more to move towards 8200. Additionally Nifty 30 min has been forming a megaphone pattern..it is also called a broadening pattern.This has short term bearish implications.Nifty could correct to 7820 levels or even to 7700 levels before the final upward c commences. Of course, these are just projections. We will only take a trade after the market moves into a direction.And protect our capital with adequate stop losses. Pl update on any imp. Astro observation that you have for the coming week. I have posted my Astro Observations.Please see. Pl. correct the 61.8% by 161.8%. Rajesh, thank you for pointing out the typo.I have since corrected it.